 Zoi Ouzas (Zo-ee Oh-Zas) has been providing real estate services for more than 29 years. Zoi & her husband Sam have lived & raised their family in this picturesque Niagara region for more than 40 years and possesses a thorough knowledge of the area. Zoi’s clients will attest to her expertise & total commitment to go the extra mile to ensure complete satisfaction. The majority of her work comes from referrals & past clients. Zoi is passionate about service & strives to exceed her client’s expectations. It is this dedication to service that has resulted in Zoi being honoured in the RE/MAX Circle of Legends, RE/MAX Hall of Fame, consistently achieving the elite Chairman's Club Award, Platinum Award, the Lifetime Achievement Award and the newest Titan award. Zoi is ranked among the top 1% of RE/MAX agents worldwide. Giving back is of utmost importance. Zoi donates a portion of every commission to Children’s Miracle Network and the Canadian Cancer Society & is a regular contributor to the McNally House Hospice, Big Brothers/Big Sisters, the Grimsby Museum, among other charities, local groups & events. STAGING has become an integral part of the home marketing process. A staged home tends to sell for more money & in a quicker amount of time. Zoi has been personally assisting her clients in preparing their homes in order to get them market-ready & picture perfect throughout her career & continually updates her skill in this area. With her distinctive home staging flair, professional photography, marketing talent & unique marketing plan, she strives to make your home the Buyer’s choice. “Whether you are BUYING or SELLING a home, our desire is to achieve maximum results for every one of our clients. I encourage you to tour my website - It contains a wealth of information & tools for both Buyers and Sellers. Target marketing providing exposure for out of town buyer: "As a member of the Toronto real estate board, I aggressively advertise your listings to Buyers in Toronto & the GTA area"
Serving all my clients' real estate needs in Hamilton/Burlington & Niagara including Grimsby, Lincoln, West Lincoln, Hamilton, Stoney Creek, Burlington, Ancaster, Jordan, Vineland, St. Catharines, Niagara-on-the-Lake & Niagara Falls. Accredited Staging Professional - "I love personally working for my clients in getting their home market ready. Staging is a passion of mine!" "Gardening is one of my favourite hobbies along with reading a good book"